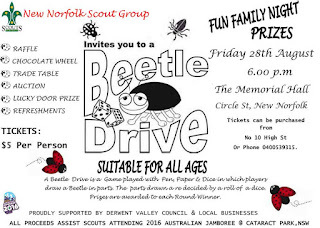 THE New Norfolk Scout Group will hold a Beetle Drive on Friday evening next week to raise the necessary funds to send eight local scouts to the Australian Jamboree in NSW in January 2016. This will be the first time (or the first time in a long time) that the New Norfolk Scouts have sent a group of scouts to a Jamboree. 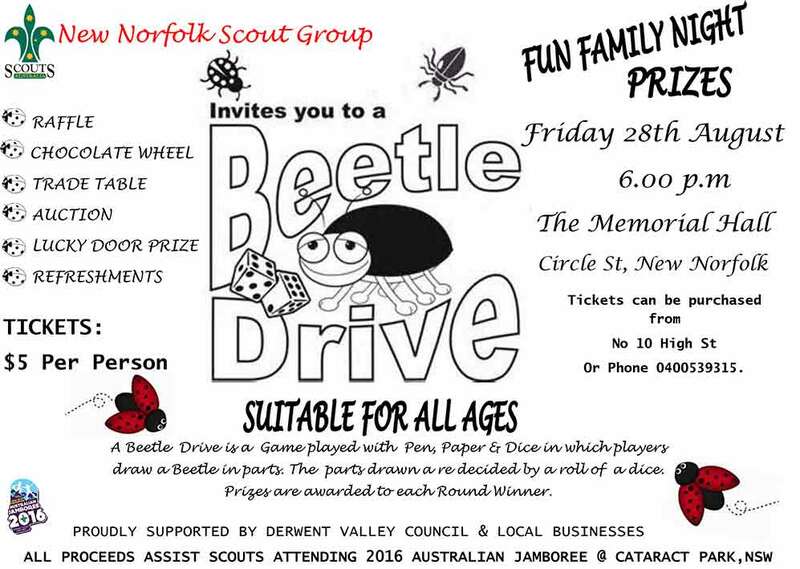 Suitable for all ages, the Beetle Drive will be held on Friday, August 28, at 6pm in the New Norfolk War Memorial Hall, Circle St. Tickets cost $5 and can be purchased at No. 10 in High St. There is more than $1000 worth of prizes to be won, thanks to donations from local businesses. Two major raffles will also be conducted and a light supper will be served. There will also be a chocolate wheel, auction, trade table and lucky door prize.